In the Bakken oil fields business goes on 24 hours a day, 7 days a week, 12 months a year, so companies that support them like Design Space need to operate right along with them. In a tough and growing environment companies need quality mobile offices and storage containers to operate, and that is what we provide. If you were traveling through Williston, ND early in the early morning last week, you would have seen a few things. The most obvious was that it was only the week before Thanksgiving, but winter moved in early with snow and temperatures well below zero. 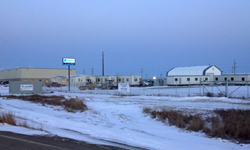 Second, just off Highway 2 in Williston you would see that Design Space Modular Buildings was open for business. That is a welcome sight for companies operating in remote locations throughout the tough environment of western North Dakota. In the Bakken oil fields business goes on 24 hours a day, 7 days a week, 12 months a year. Oil production does not stop for cold weather. That effort is what is driving oil production in the state to a hard to imagine 1 million barrels a day. And neither does construction for the many companies trying to build businesses and infrastructure to support the booming oil industry. But, this progress doesn’t happen without some protection from the weather. Because of that, Design Space Modular Buildings plays a key role in making it all possible. Design Space can provide temporary mobile offices for short-term needs; this can be for a construction office for builders, a temporary office for a commercial business to get up and running quickly, or for oil field offices at drilling rigs and support services sites throughout the state. Design Space serves permanent needs too. The building season is short in this climate. Using modular construction Design Space can build the building off site in a factory, and then deliver, install, connect utilities and have the building ready for occupancy in less than 2 months. Design options are almost unlimited and can give the modular building the same look and feel as conventional construction in a fraction of the time. Protecting people is critical, but protecting material is important too. For this, Design Space Storage Containers offers portable storage containers, and can deliver them to the customer’s site with their own trucks and trailers. “In a tough and growing environment companies need quality mobile offices and storage containers to operate, and that is what we provide,” says Dave Erickson, sales manager in Williston, North Dakota with Design Space Modular Buildings. If you would like additional information on Design Space and their products please visit their website at http://www.DesignSpaceModular.com or call 866-889-7777.